Hopscotch has been a favorite programming app of my students ever since they tried it for the Hour of Code a couple of years ago. One of my 5th graders chose to use Hopscotch to create his entire Genius Hour presentation last year. Hopscotch is now offering a new curriculum for educators and I had a chance to sneak preview it before yesterday’s release. I am very impressed by the format of the lessons, which were created using the Understanding by Design framework. There are 6 lessons, about 45 minutes each, targeted for 5th-8th grades. However, there is a lot of flexibility that allows for modifications for younger and older students. The lessons include ideas for differentiation and detailed suggestions to include many levels. Math, Engineering, and Computer Science Standards are included in the lessons. Videos links are offered for all 6 activities to either use with your class or for the teacher to watch to gain better understanding. Hopscotch not only differentiates for the students, but also for the teachers by making the instructions very clear for even those who have never used the app before. I am excited that Hopscotch is offering such an amazing free resource for educators. 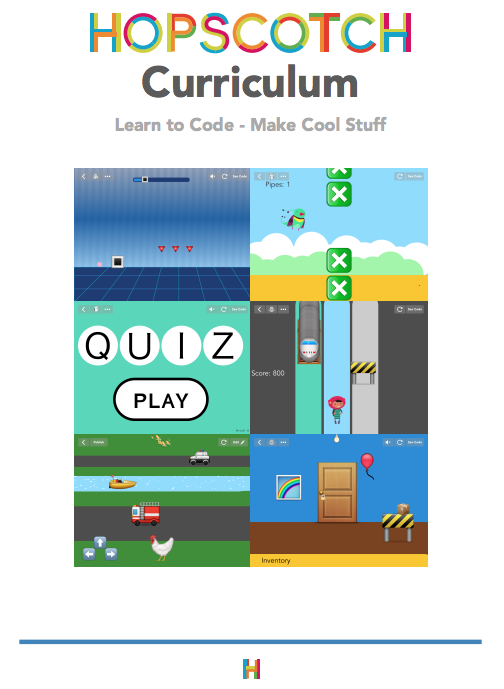 This app encourages creativity and problem-solving while teaching logic and many math skills. Don’t worry if you have never programmed before. With Hopscotch, you and your students can learn together. You might want to try Scratch Jr. with the K-1 students as a starter. Daisy the Dinosaur is good, too. They are both iOS apps.